Metabolism is the process through which the human intake of food and drinks are transformed into energy. In their constant fight against weight gain, experts have included metabolism as a factor in this process. 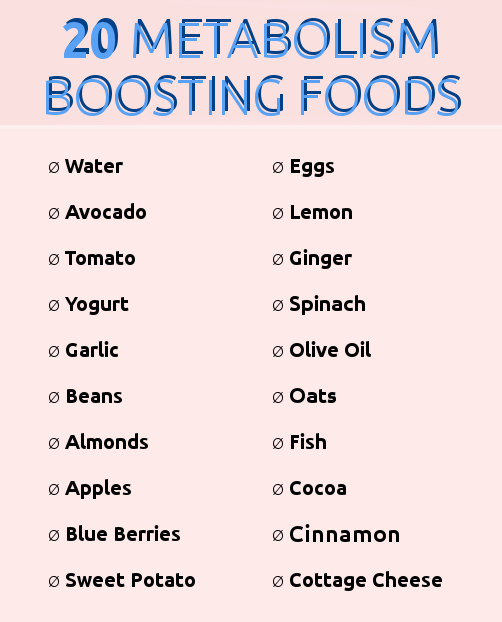 Some foods are metabolism boosters and help reach this goal. Drinking much water can help speed up our weight loss. A study stated that drinking two cups of water increases metabolism by 30% for 30 to 40 minutes. It is true that the water's effect may be small but if combined with other factors, it can help. Water helps regulate our metabolism, hence burning more calories. Almonds are low-calorie diet that assists in losing weight. It also controls the insulin level and keeps you full for longer hours. The protein found in almonds fights hunger hormones and burns belly fat. A handful of almonds between meals curbs hunger and decreases your desire for more food. Olive oil is a good substitute for butter and creams. It is full of monounsaturated fats that help the body burn calories. Our meals are usually rich in fats and carbohydrates. Adding some garlic can help us get rid of their nasty effects. Garlic supports blood sugar metabolism and helps control lipid levels in the blood. A cup of yogurt and a slice of fruit can be a good breakfast meal. Yogurt is a common breakfast rich in protein which is great for your metabolism because it requires your body to do more to break it down. Low-fat yogurt helps lose weight and boost metabolism. Yogurt is full of calcium and protein. It provides the body with the necessary energy it needs. Also, the probiotics or good bacteria there, help digest food more effectively. Eating an apple a day doesn't only keep the doctor away, but also keeps the fat away. Each apple contains about 15% of your daily need fiber, which impedes the absorption of glucose in the bloodstream to help regulate blood glucose levels by slowing the absorption of dietary sugar intake. Apples also, make you feel full for a long time and keep your digestive system healthy and strong. It is a common spice that works to stabilize blood sugar. It also increases our metabolic rate. Cinnamon can be added to yogurt,cereals, over fruits or even in our tea. Researches are under way to make it as a remedy for type 2 diabetes. The heat in ginger roots diminishes our desire for eating. It also helps in digestion and increases the metabolism rate. Ginger can be added to your tea or other foods. It is rich with monounsaturated fatty acid, which turns off the body's signal to store fat. It is very nutritious. It contains Omega 3fatty acid, mood boosting vitamin B and folate, potassium and vitamin B for healthy, glowing skin and hair. Oats help balancing the blood sugar level in the body. Unlike many other foods that cause blood sugar spikes, whole grains, including oats help in keeping the insulin level low after your meals. This insures that the body burns calories instead of storing them as fats. Trust in yourself.. Start to change things around you.. Your clothes, buy clothes that fit in the body of your dreams..